You may receive updates from Northeast Ohio Alliance for Hope (NOAH), the sponsor of this petition. 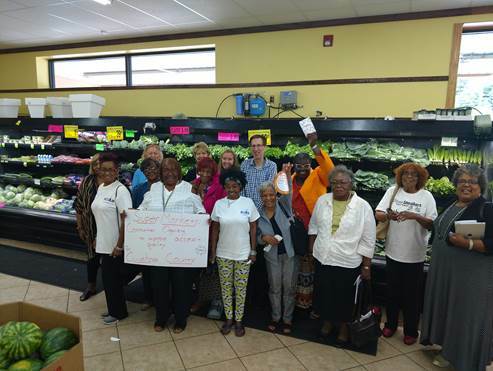 To build opportunities for everyone to have a fair chance to be healthy, we urge Cuyahoga County to support improved access to high quality supermarkets in under-resourced communities. Residents in East Cleveland and other under-resourced communities are more likely to suffer from chronic diseases and live shorter lives compared to residents in the rest of the county. High quality supermarkets provide jobs, an increased tax base, healthy and affordable food and attract and stabilize other local businesses. We believe that improved access to high quality supermarkets should be a strategic priority for Cuyahoga County Leadership. There are recent successful examples in the City of Euclid and in the Buckeye Neighborhood in Cleveland of community-based supermarket implementation projects. In both cases, collaboration among local and county government and strong resident participation were integral to providing high quality, stable supermarket access for neighborhoods that previously did not have it. In addition, on-going collaboration in the Midtown neighborhood is another example of collective supermarket implementation. We ask for the cooperation of Cuyahoga County to allocate resources to support the implementation of high quality supermarkets and Community Benefits Agreements that seek to promote cooperation and accountability among residents, storeowners and local government. We ask that Cuyahoga County considers the importance of building wealth within communities most affected by supermarket access issues. Therefore, strategies may include the prioritization of funding for storeowners who live in or reflect the communities that they serve, or who are committed to providing meaningful community benefits such as hiring local, providing community meeting space or budget transparency to name a few. We believe that the public sector has a responsibility to address disparate access to high quality supermarkets in our county. This petition represents the support of everyday Cuyahoga County residents who believe that fair access to supermarkets is a pressing need in our neighborhoods. Click here to read more about supermarket access in Cuyahoga County.